Apple’s latest tablet offerings will be available for pre-order on Friday, October 26. If this process is anything like past pre-orders, then it will probably go live at midnight PST/3AM EST tonight. Not sure if you should pre-order or just wait for the retail locations to snag your device? We don’t blame you. Midnight to 3 AM (or later) can be a tough timeframe, especially for a school/work night. But don’t worry — we’ll get you through the launch frenzy with this handy guide to getting your hands on an iPad mini or fourth-generation iPad (or iPad 4, as we’ll call it. It’s just simpler that way). What’s available for pre-ordering: The 16GB, 32GB, and 64GB WiFi-only models of the iPad mini and iPad 4. How long will it take until I have some sweet tablet goodness in my hot little hands? : That depends. The Wi-Fi-only models will ship (and be in stores) on Nov. 2. The Wi-Fi+4G versions will be available some time in mid-November, though actual dates haven’t been made public yet. If they burn through the initial supply — and that seems like a probability — it could take even longer. So you’ll want to get in early, if you can. When will Apple Stores have stock on the shelves? : The Wi-Fi-only models will be in stores on Friday, Nov. 2 at 8 AM. Again, the WiFi+4G tablets are expected in mid-November. Where to preorder? Go to Apple’s online store or call 1-800-MY-APPLE. Don’t physically go to your local Apple store — they don’t do pre-orders there. Ditto for the carriers or third-party retailers. None have done any marketing around this, and at least one carrier (Sprint) went out and flatly stated they aren’t taking any pre-orders at this time. (However, there are reports that the carriers will be opening orders a couple of weeks after Apple’s initial launch.) So the only confirmed source right now is Apple. The Apple Store iOS app might also be another way to get your pre-order in — it has been in the past — but no mention has been made of that yet. So for now, if you absolutely have to have it, stick to the website or phone number. Can you pre-order for your whole family? : Probably not. The company usually limits pre-orders to two units, to discourage unscrupulous types from grabbing all the inventory and charging inflated prices for them. Apple capped preorders for the September iPhone 5 release and the iPad 3 debut in March, so it’s likely they’ll do the same this time around. In what countries will they be available initially? Aside from the U.S., there are 33 other countries that will able to preorder on Oct. 26 or buy at the store on Nov. 2: Australia, Austria, Belgium, Bulgaria, Canada, Czech Republic, Denmark, Finland, France, Germany, Hong Kong, Hungary, Iceland, Ireland, Italy, Japan, Korea, Liechtenstein, Luxembourg, Netherlands, New Zealand, Norway, Poland, Portugal, Puerto Rico, Romania, Slovakia, Slovenia, Singapore, Spain, Sweden, Switzerland, and United Kingdom. 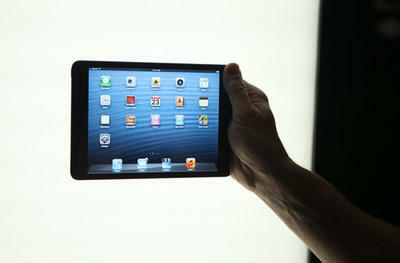 Are you going to preorder the iPad mini or fourth-gen iPad tonight? Let us know what your plans are and, if you do, what your pre-ordering experience was like in the comments.